In a sauce pan combine pineapple juice, orange juice, soy sauce, vinegar, garlic, mustard, and brown sugar. Bring mixture to a boil and white it is cooking combine cornstarch with water. Mix together and add it to the boiling sauce. Reduce heat and whisk until sauce thickens then remove from heat. Set aside and allow to cool slightly. Add olive oil to a frying pan on medium-high heat. 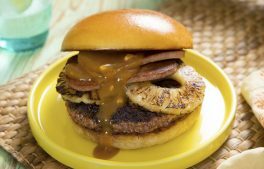 When oil is hot, add pineapple slices and grill until golden (2-3 minutes per side). Set aside. In the same pan, add slices of spam and grill until golden (or desired doneness). Set aside. 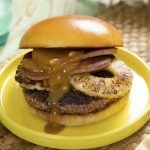 Build Your Burgers: Bottom Bun, Burger, Pineapple Slice, Spam Slice, Hawaiian Sauce, Top Bun.